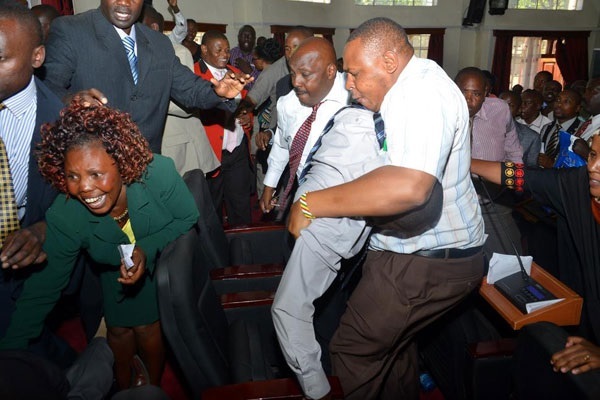 The legislators identified as Joyce Anyiso and Jacqueline Manyara started by hurling insults at each other but quickly degenerated into a full blown physical fight. The ensuing melee attracted the attention of journalists covering the Assembly sessions, even as their colleagues protested that the fight was a “family and personal” affair. The scuffle came to an end after the security staff at the Assembly was called in to restore order and separated the two dishonorable members. This is not the first incident where members of County Assemblies have resorted to physical fight after a disagreement. However, Nakuru County is notorious for this behavior.